Make sure to rest and drink plenty of fluids. That’s the age-old mantra given to those feeling under the weather. You’ve heard it a thousand times. But, why do you need to stay hydrated and what exactly should you be drinking while sick? It’s important to stay hydrated every day, whether you’re sick or not. But dehydration during an illness can exacerbate your symptoms. It could lead to sinus dryness, pressure and even nausea and vomiting. If you spike a fever, you can dehydrate yourself even faster than normal. It’s important to replace the fluids you’re losing with new ones. Water – This one may seem obvious. Consuming plenty of water will help you replace what you’re losing. And, it doesn’t contain any additives that can harm your teeth. Tea – Since tea contains water, it will help you stay hydrated while providing additional benefits. 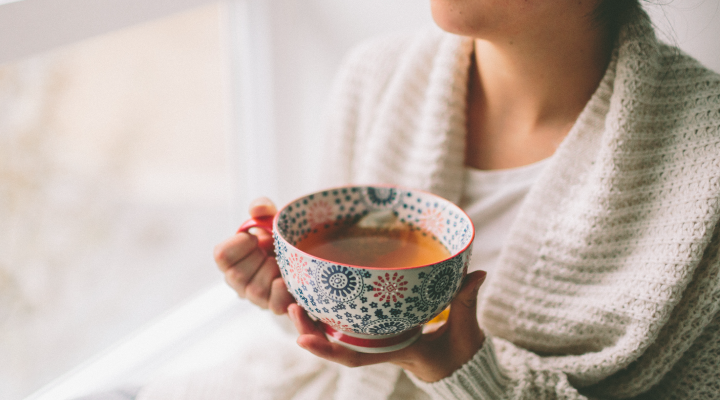 Many used to think that tea dehydrated you, but that myth has been debunked. Green tea, for example, can fight unfriendly mouth bacteria. Soups/Broths – These are a good way to keep food down while sick. Water-based soups and broths will help hydrate you while the heat will reduce any mucus buildup. Sugary drinks – Sports drinks and tooth decay go together like peanut butter and jelly. Beverages like sports drinks and fruit juices can seem like a good choice when you’re sick, but they don’t help with hydration. The added sugar isn’t mouth-friendly and can lead to tooth decay. Alcohol — While there are a few tall-tale alcoholic remedies (we’re looking at you, hot toddy! ), drinks containing alcohol should be avoided while sick. Alcohol dehydrates you and can dry out your mucus membranes, leading to more of that gross green goop coming out of your nose. And no one wants that. Yes, you can over-hydrate yourself. Your body can have so much hydration that it depletes your sodium level. This is known as hyponatremia. Although rare, it can occur if you’re overzealous with your fluid intake. Don’t let this stop you from hydrating while sick. Just use your thirst as a gauge. If you’re thirsty, that’s a sign that your body is looking to replace fluids.